CCWD has four water supply sources: Pilarcitos Lake, Upper Crystal Springs Reservoir, Pilarcitos Well Field and the Denniston Project. 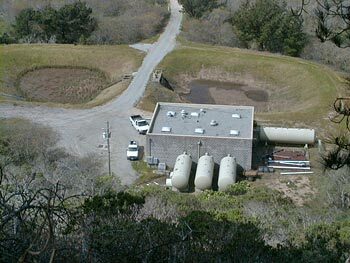 The first two are owned and operated by the San Francisco Water Department; the latter two are owned and operated by CCWD. The system consists of two water treatment plants, 17 miles of transmission pipeline, 83 miles of distribution pipeline, several water storage tanks, and other equipment. The average annual yield from these four sources is about 830 million gallons. Approximately 28% of the District's water supply is produced locally from both wells and surface water. The remaining 72% is purchased from the SFPUC. The District operates wells adjacent to Denniston and Pilarcitos Creeks. It also diverts surface water from Denniston Creek. Water from San Francisco is supplied by gravity flow from Pilarcitos Reservoir or is pumped over the mountain from Upper Crystal Springs Reservoir. Pilarcitos Lake can produce up to 1.3 million gallons per day by gravity flow. When the daily demand exceeds available water from Pilarcitos Lake, water is taken from the Upper Crystal Springs Reservoir Pump Station. Water in Upper Crystal Springs Reservoir comes from the Hetch Hetchy supply in Little Yosemite Valley in the Sierras. The Crystal Springs Water Supply project was completed in 1994 and consists of an eight-mile pipeline connected to a pump station and intake tunnel under the reservoir terminating at the Nunes Water Treatment Plant. Deliveries taken from Crystal Springs Reservoir and Pilarcitos Lake are limited by the capacity of the Nunes Plant, currently 4.5 mgd. Water is taken from Crystal Springs when it is not available from Pilarcitos Lake. However, this source is more costly than Pilarcitos water because of associated pumping costs. The Pilarcitos Well Field and the Denniston Project also supply water. Water from the Pilarcitos Well Field is limited to pumping between November and March and cannot exceed 117 mg per water year.